The Privately owned W-Ranch is located on 270 acres overlooking Georgian Bay in Carling Township. Learn to ride and spend safe, quality time in the barn with the horses. Camp runs one week in July and one week in August. Please email info@wranch.ca for details! 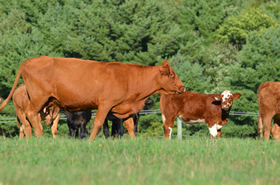 Our grass fed, lightly grained cattle are born and raised on our pastures in Carling and Whitestone Township.